This is a very easy chicken pot pie recipe you can make for dinner during a busy week. Maybe you have been doing yard clean up all day and you’re looking for a cozy weekend meal to enjoy with a salad and glass of wine. This recipe is for you. This post has affiliate links to our favorite items used in this recipe. If you purchase through these links a small commission is earned that helps to run this site. Thank you! When the air turns crisp, it’s time to break out all the stops and load up the pantry for comfort food recipes like Crockpot Mac and Cheese or delicious French Onion Soup. This easy chicken pot pie recipe is one I keep handy for days where time seems to pass faster than I realize and need to get dinner started quickly. When the clock says 3 o’clock, and dinner plans are not finalized, a run to the grocery store is a must. You can pick up a couple of fresh rotisserie chickens, a can of Campbell’s Cream of Chicken Soup , and a Pillsbury Pie Crust. I know- you are probably going to ask “Kelly, why don’t I make everything from scratch? !” and I will say because your family is going to be hungry in an hour! I can be a purist when it comes to pie crust, but when pressed for time, store-bought pie crust is the way to go. Can you make chicken pot pie from scratch? Of course! You can’t beat using the perfect roasted chicken with homemade crust and creamy gravy filling. But, when it comes to crunching time, throwing together the essential ingredients, even if they are store bought, still has a very tasty outcome. 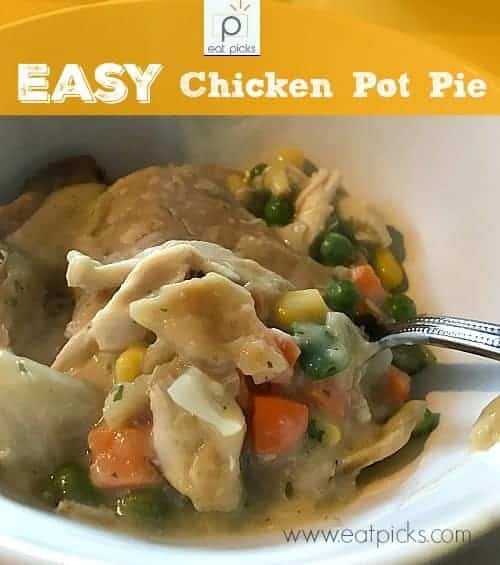 Using Pillsbury Pie Crust , Campbell’s Cream of Chicken Soup and frozen vegetables saves you time, it is a cozy meal you can enjoy with your family and I guarantee it will be on your meal plan rotation. This question comes up a lot and the answer is yes! The best way to achieve this is to prepare your chicken pot pie up to the point before baking. Cover with plastic wrap and then aluminum foil and place in freezer for up to 1 month. Freezing Tip: On top of foil, write baking time and temperature in sharpie marker and the date you froze your dish. Remove foil and plastic wrap before baking. Place frozen pie on a sheet pan and bake for 20-30 minutes longer than fresh bake. 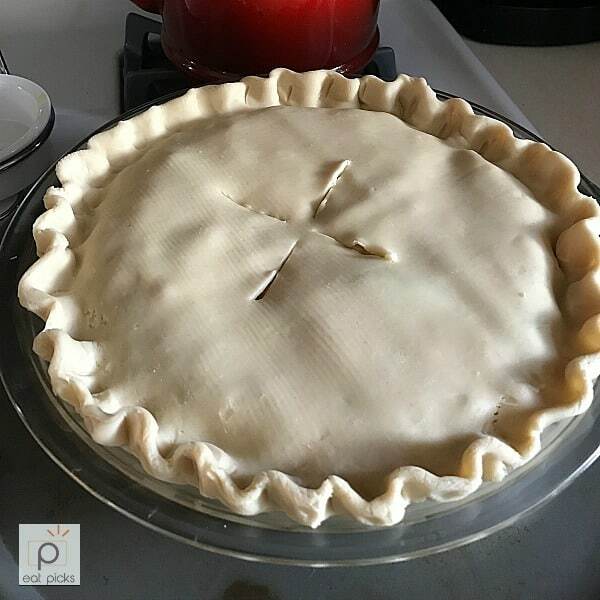 Be sure center is bubbling and crust is baked before removing. Over medium heat, melt butter in medium saucepan . Add onions and cook until soft and translucent. Add soup and water. Stir until hot. Add frozen vegetables. Stir until hot. Add chicken and spices and stir. Simmer until mixture starts to bubble. Place second pie shell over the top. Seal together and slice 4 slits into top crust to vent. Place on sheet pan and cook 30-35 minutes or until crust is golden brown and filling is bubbling. If you love this Easy Chicken Pot Pie recipe, please help me share the love by sharing on Facebook and Pinterest! And be sure to tag us @eatpicks- #eatpicks if you share on Instagram so I can see! So whip out your favorite apron, and here is a printable recipe! An easy chicken pot pie recipe that will save you time in the kitchen and still provide a delicious, cozy meal for your family. In 9-inch pie plate place one pie crust shell in bottom of dish. Over medium heat, melt butter. Add onions and cook until soft and translucent. Add soup and water and stir until hot. Add chicken and spices, stir until all ingredients are combined and simmer until just starting to bubble. Pour chicken and vegetable mixture into pie shell. Place second pie crust over the top. Seal together and slice 4 slits into top crust to vent. Place on a sheet pan (to catch any drips) and cook 30-35min or until crust is golden brown and filling is bubbly. Thanks for sharing this recipe. I remember your pic on Instagram and have been craving pot pie since! 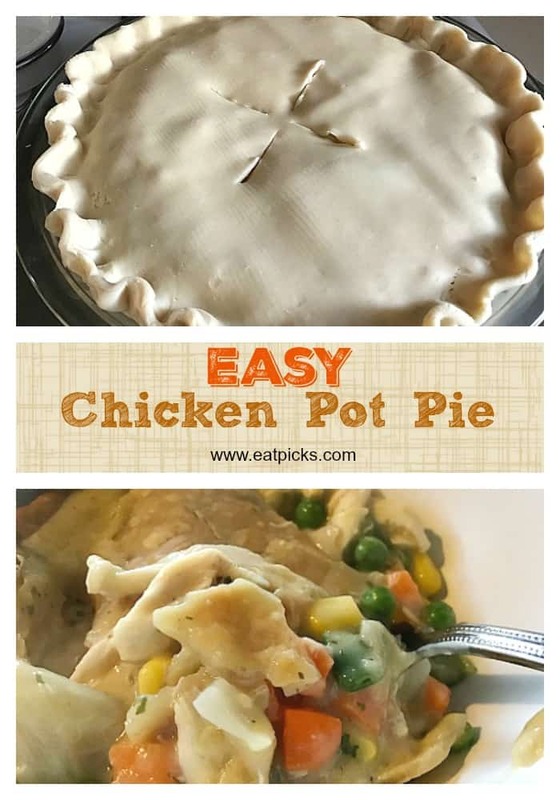 I love chicken pot pie and easy is the best way to cook. Yes, easy is the best way to delicious! Give this recipe a try and let me know how it turns out. Glad you enjoyed it! You will really like the chicken and capers too! This looks yummy! Could you make it and freeze the pie for later? I mean will it affect the dough? I’m guessing after assembling you could freeze it; then bake when ready. I added poultry seasoning and it honestly took it to a whole other level in deliciousness. That sounds delicious! Will be great as a turkey pot-pie this week! I made this for dinner last night and my boyfriend actually had a second serving. Thanks so much! So happy to hear he enjoyed it! Thank you for sharing! This was so yummy! My family devoured it. Quick and easy, I was able to make this on a weeknight after work. I used some of our frozen leftover turkey from Christmas. I made this for the first time tonight and I thought it was ok. I need to try more seasoning next time. But hubby thought it was dry. Should I add more water or more cream of chicken soup? 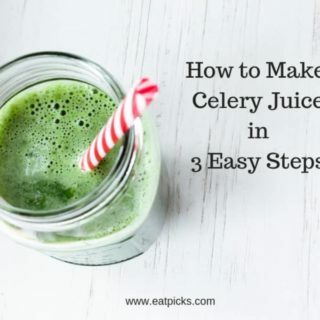 This is SO easy and SO good! Family loved it. Maybe I should have made two pies ? This was delicious and sooo easy. My husband loved and he’s very picky! It is an easy recipe! Glad your husband enjoyed it!